In the words of Winston Churchill, “Democracy is the worst form of government, except for all those other forms that have been tried from time to time”. Although it is with little doubt that Churchill’s statement contains some truth, and democracy has been a relatively successful project within the realms of Europe, North America and Oceania, democracy, in practice, has yet to be fully established elsewhere. Most countries in Southeast Asia are not ruled democratically and this absence of tangible democracy is spurring an emerging trend that can only be described as ‘democracy worship.’ The people and groups leading this trend have glorified and simplified the basic principles of democracy, elevating the political system to cult-like status. Democracy is discussed and demanded as the instantly required form of government that a state must adhere too. At times individuals describe it, unintentionally and intentionally, as that of perfection and utopianism. Examples of ‘democracy worship’ can be seen throughout Southeast Asia, however, it is most obvious in Thailand, where Democracy is admired and sacralised, with little thought given to the complexities or theory behind it. Equally as clear is the problematic nature of their democracy or lack of it. Rightly so, such desire for democracy is valid as Thais have lived in a constant state of semi-democracy, constantly interrupted by aggressive coups, appointed Prime Ministers, and full blown dictatorships, forming a repetitive pattern that has reoccurred for decades. Coup culture within Thailand has many unique characteristics, with two standing out more than others; the worship of democracy within certain areas of society, and an almost blasé attitude towards military coups. 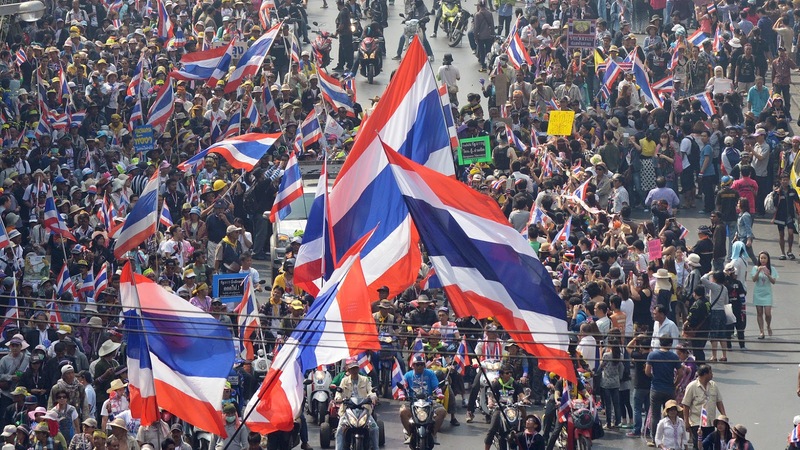 Again, there are legitimate reasons for individuals to desire a ‘return’ to democratic governance, however, the simplistic arguments over the desire for democracy currently circulating in Thailand, are in danger of neglecting the complexities of democracy. Social media, an understated instrument of political discourse within Thailand, helps to demonstrate democracy worship and the cult-like following that has been attracted by democracy’s ideals. The trend may also be enhanced through other forms of worship within Thailand, such as ‘academic worship’ and ‘professor worship’, which can give academics a cult following of their own, whether they like it or not. So-called ‘celebrity’ academics, either living in Thailand or based abroad for political reasons, are highly active in posting and promoting democracy related material on numerous social media platforms. The majority of the time such posts contain little or no explanation of how democracy can become successful, or what the major obstacles to democracy could be – particularly important given the complicated issues related to the balance of power and powerful institutions within Thailand. However, a single post can get over 10,000 ‘likes’ and be reposted 100s of times. It is also common for these ‘celebrity academics’ to post up to 10 democracy-themed posts per day, again, demonstrating the need for Thailand to return to democracy but offering no solutions, suggestions, or critiques of the more complicated issues. Stark divisions and aggressive polarisation is endemic throughout all aspects of Thai society including; governance, the religious establishment, the supreme institution, the military, civil society, and educational institutions. The interconnectedness between networks of power in Thailand is multifaceted, complexed and ingrained. Well-known academic Duncan McCargo coined the term ‘Network Monarchy’ to describe the complex network of interconnected power that holds up the country’s royal institution. By fusing itself to all aspects of Thai society, and spreading influence to all corners of the country, the monarchical institution has occupied a seat of supreme dominance and reverence in Thailand, entrenching its values to ensure its continued survival. It is here, within the realm of ‘networks,’ that those who situate themselves within the cult following of democracy, or worship democratic principles, neglect to understand the intrinsically problematic nature of democracy in Thailand. A functioning democracy, adhering to democratic principles, cannot operate within a country that fosters such a complicated network of relationships, all attempting to receive, abuse or hold on to some form of power. Arguably, these networks of power exist within democratic countries as well, particularly the United States. However, in the United States there are also independent checks-and-balances, reinforced by strong institutions, capable of limiting the means of those seeking to abuse power. These independent reinforcements have disappeared from Thailand’s political landscape. The power and influence of the Thai military, which sits above all other forms of power, except the royal institution, needs to be completely dismantled. Speaking hypothetically as there is no possibility of this occurring any time soon, before democracy can become any more than a ‘desire,’ the military should be placed in civilian control and given little or no capacity for influencing power relations or promoting democratic ideals. In the future Thailand could take note from Indonesia and how it went about limiting the power and influence of the military. The legitimacy that the monarchy, and thus in turn the military, receives due to their relationship with the Buddhist establishment, the Supreme Sangha Council, also needs to be understood as a significant road block to democracy. The Sangha is undeniably connected to the realm of long-established networks, and is constantly attempting to protect its members’ privileged position of power and reverence in Thai society. With such a complicated and multifaceted network, democracy has many obstacles, as the old establishment will always be able to legitimise itself through the many sensitive and controversial aspects of the network, particularly religion. Another major problem with democracy in Thailand is the issue of regional divides. So called ‘red provinces’ that have been branded as Shinawatra supporters, or endorsers of Thaksin-associated political parties, can boast growing populations and a larger voter base than those on the opposing side, or sides, of politics. Especially those whom are supporters of the old establishment. If democracy does ‘return’ to Thailand, it is inevitable that those aligned with Thaksin Shinawatra would return to power with a majority of the vote, significantly threatening those aligned to more established power bases, such as the monarchy, military and the consumerist city based elite. Such established power bases will not accept a threat to their power or loss of power and will once again support and orchestrate a coup. The cycle will continue. Those in Thailand who are unofficial members of the democracy cult continue to constantly and simplistically argue for democracy to return to the country. This is admirable at first glance, however with a more in-depth analysis, it is clear to see that democracy is impractical and will likely end in additional violence. Both Thai and foreign academics, journalists and civil society groups all argue for an instantaneous restoration of democracy in Thailand. What they fail to mention or discuss, is how? How does one take on the old establishment, a force that takes its legitimacy from the untouchable royal institution? Members of the democracy cult or those who worship the idea of democracy need to redirect their attention to aspects of the so-called network power issue. They need to explain how balances of power need to change, the relationship between the military and the monarchy, the enormous division within the Thai populous, and the relationship between the old establishment and elite and the monarchy and majority religion. 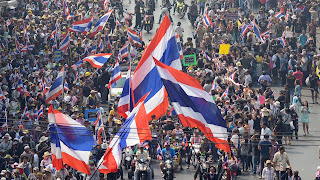 Worshippers of democracy who argue for instant democracy to take place within Thailand are also underestimating issues of systematic corruption that have plagued semi-democratic governments in the past. Although elections won by both Thaksin and Yingluck were reasonably democratic, and inappropriately nulled, both governments struggled with corruption. However when it comes to corruption, the established elite are significantly more susceptible to its more dramatic forms, thus there is a valid argument behind those who argue that democratic governments foster less corruption. Arguing for democracy is admirable and deserves respect, however to the extent it is promoted and discussed on social media and elsewhere, it is problematic. Democracy is not possible in Thailand anytime soon, and those who continue to contribute to ‘democracy worship’, do nothing more than demonstrate the lack of solutions and impracticality of democracy in such a fractured society. It would do the democracy argument well if attention was redirected to tackling some of the larger issues that act as roadblocks to democracy. 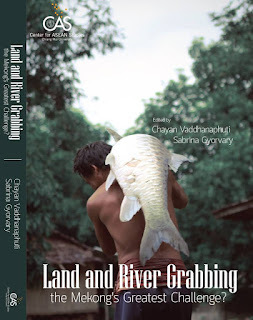 Below is my brief chapter (the epilogue) in the up-and-coming book, 'Land and River Grabbing'. It is a series of short stories and research projects from youth throughout the Mekong Region. Something powerful happens within a society when young students, scholars and activists make it their priority to research and discuss issues of importance to them. Although the issue maybe small, in relation to the size of ASEAN and the Mekong region, significant attention can be drawn to the issue when young people are both passionate and persistent. These voices thus gain attention within domestic and regional political spheres, ensuring that regional development is sustainable and decision-making inclusive. This collection of stories, independent research and personal accounts of issues throughout the Mekong region demonstrates how young people can effectively challenge the establishment and bring about change. Each individual paper gains legitimacy and credibility from the personal narrative and first-hand experience of the author. Mekong governments and corporations will constantly be held to account by a collaborative cross-border youth movement that strengthens Mekong regional civil society. This emerging Mekong regional civil society and youth movement provide a crucial check-and-balance system that draws attention to corrupt and unsustainable practices. The very fundamentals of ASEAN, its principles and aims, make regional governments reluctant to criticize one another. Arguably the most problematic institution within ASEAN is the ‘so-called’ ASEAN Way. Numerous scholars argue that the ASEAN Way facilitates regional security on a state-to-state basis. Although is it possible to argue that ASEAN has prevented regional and bilateral conflict, the ASEAN Way neglects domestic and border development issues. It is within this neglect that civil society movements, especially those lead by local youth, can play an active part in facilitating positive change by drawing light on issues. There is a collision point that puts local activists, youth lead organisations and NGOs against that of state-sponsored, endorsed and constructed development projects. Although there is a need for development to ensure continued prosperity, there is a desperate need for more appropriate checks-and-balances to ensure local communities and peoples are not negatively affected. All papers within this book clearly demonstrate this ‘collision’ point, where large-scale development projects collide with the livelihoods of local populations. With all ASEAN counties enforcing significant limitations on the local press, restricting the ability to challenge government decisions, local youth and civil societies are crucial in drawing attention to issues. Investigating the lack of access to information is an important starting point. Many governments and corporations deliberately exclude local communities in decision-making processes by producing reports that are not in local languages and using complicated and jargonistic language. The renowned Economist and International Development expert Jeffery Sachs calls the current period we are living in, ‘The Age of Sustainable Development’, meaning there is no more pressing issue to ASEAN and Mekong member states than that of sustainable development. Sachs argues there are numerous environmental threats that are continuing to gain in severity, “…humanity is changing the Earth’s climate, the availability of fresh water, the ocean’s chemistry, and the habits of other species..” (Sachs 2015:2). He then poses the question, “…what happens when the world economy is on a collision course with the physical environment?” This collision is obvious within the Mekong region as development increasingly affects locals and the environment in which they live. Sachs states there are three crucial factors of sustainable development that are all intrinsically interconnected and must receive an equal amount of governmental and societal respect. They include economic, social and environment factors. He then concludes that all three factors rely on one crucial factor, good governance, not just governmental governance but also corporate governance. It is then obvious that without good governmental structures, there is a lack of accountability, endemic corruption and a neglect for aspects of ones population. Through Jeffery Sachs’ assessment it is clear that Mekong countries will continue to struggle and fail at sustainable development until good governance is achieved. Sachs states, “…Multinational companies are often the agents of public corruption, bribing officials to bend regulations or tax policies in their favour and engaging in tax evasion, money laundering, and reckless environmental damage” (Sachs 2015:4). The local communities affected by developmental projects mentioned in this book are in desperate need of their respective governments to respect the principles of good governance. In drawing attention to unsustainable development practices, civil society movements highlight the need to improve the internal governance of Mekong countries. Without good governance, individual citizens will constantly face complicated political infrastructures, corrupt bureaucracies, and powerful and unregulated multinational and national companies. Li Miao Miao clearly demonstrates what a lack of domestic and regional governance can do, especially in the case of powerful overseas investors, and how affected communities often have limited or no access to appropriate grievance mechanisms. The construction of the Lower Sesan 2 Dam makes clear the Cambodian government’s desire for rapid development, and the failure of the country’s legal system to guarantee the rights of its citizens. Aye Mon Thu, Khaing Mi Phue Aung and Saw Lay Ka Paw clearly provide evidence for the collision point between the need for development, the lack of regulations and good governance and a neglect for local communities. In their individual case studies of environmental and development issues in Myanmar, local communities are constantly challenged by companies looking to maximise profits. They also demonstrate the Myanmar government’s haphazard approach towards regulations, and the poor implementation of laws that have made it into legislation. Ashijya Otwong describes another phenomenon of bad governance in the Mekong region, providing evidence of how Thai companies have shifted their investments to neighbouring countries with less developed legal systems and fewer regulations on environmental protection. Although arguments can be made that Thailand has relatively good environmental protection laws in comparison to other Mekong countries, Thai companies are not currently required to follow domestic Thai laws outside Thailand. Dokkeo Sykham and Luuk Nam Ou concentrate on the plight of local communities in Laos and how the construction of dams on the Mekong River and its tributaries affect local populations and their livelihoods. Food production is significantly damaged due to changes in fish migration and soil erosion, and affected communities have received little or no compensation from companies involved or the government. The immense environmental impacts of dam construction on the Mekong is often ignored by Mekong governments in favor of...(can we say something about long-term food security being sacrificed for short-term profits)? Ham Oudom highlights the positive power of activism in Cambodia, as the campaign against the Araeng Valley hydro-power dam was successful in its bid to temporarily hold off construction. The Cambodian Prime Minister stopped the construction of the proposed dam during the current governmental period, due to expire in 2018, meaning although there has been an initial victory of those supporting sustainable development, the flight must continue beyond 2018. The Araeng Valley case is a powerful proof to other environmentalists throughout the Mekong region that their voices can be heard and projects can be halted. Tran Chi Thoi, Nguyen Khiem and Vu Hai Linh all discuss issues related to the lack of sustainable development in Vietnam and the limited ability local communities have to participate in decision-making around projects that will impact their livelihoods. With the Dak Mi 4 Hydropower Dam significantly affecting local communities downstream in Vietnam, producing soil erosion and dumping sand on previously fertile lands, local communities have been actively trying to access compensation and credible information from government institutions. In a similar manner, limestone mining is having dire consequences on both the environment and the health of local communities, with locals having little or no say in processes that significantly change their way of life. Many individuals within Mekong countries argue that rapid development is necessary to improve the lives of the majority. Normally ‘the majority’ means the government’s primary support bases, located in large cities such as Hanoi, Vientiane, Phnom Penh, and Yangon. Thus governments find it easy to neglect local communities. The Mekong environment is interconnected, however. The articles within this book are an important step in demonstrating the need to promote transparency and good governance within ASEAN. EarthRights International deserves much praise for the time and effort they put into equipping students to share their powerful stories. It is this generation that will effectively lead Mekong civil society in the years to come, and their strong commitment is sure to bring about positive change. Sachs, J. 2015. ‘The Age of Sustainable Development’. Columbia University Press. New York. Land and River Grabbing will be out on the 15th of June, 2015 - by Chiang Mai University Press. Another pointless Rohingya discussion. Questions once again go unanswered. 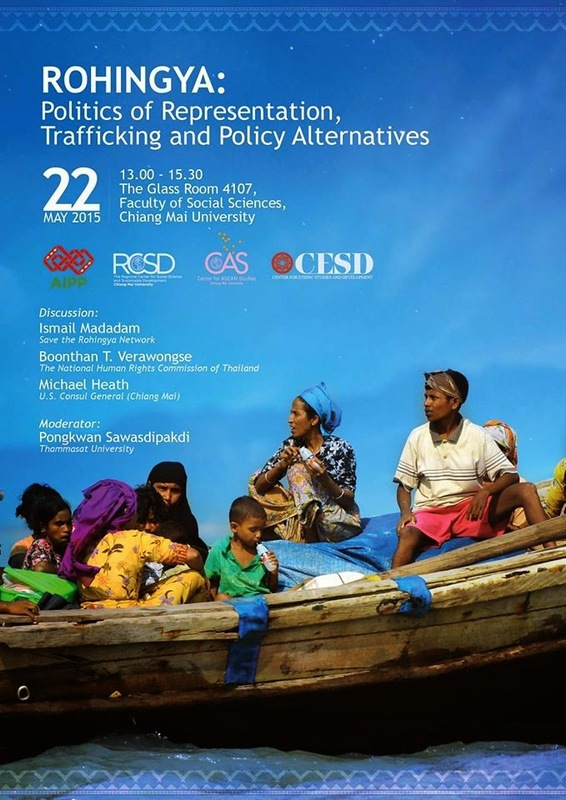 Last Friday the Centre for ASEAN Studies at Chiang Mai University held a seminar titled, ‘Rohingya: Politics of Representation, Trafficking and Policy Alternatives’. 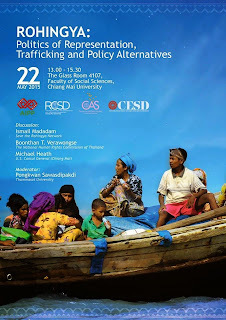 There was a lot of anticipation about the seminar due to the current situation of Rohingya adrift in the Andaman Sea, the increased persecution the Rohingya are facing in Myanmar, and the significant media attention the issue is receiving. The panel included; Boonthan Verawongse from the National Human Rights Commission of Thailand, Michael Heath - the U.S Consul General to Chiang Mai and Ismail Macadam from Save the Rohingya Network. In what I thought would be an enlightening, relevant and colourful discussion turned out to be a mixture of government propaganda, a defence of the Thai Junta and a incredibly simplistic explanation of what the Rohingya are. After feeling initially let down, I then realised that this was the issue, that no one wanted to properly and holistically discuss the Rohingya. It is either too complicated, too politically sensitive or people just do not know how to discuss the issue. Are the Thai police and military involved within the trafficking of the Rohingya? What is Thailand’s official stance on the Rohingya issue? How much is it an issue of Buddhist Nationalism and how much does the Buddhist Institution in Thailand support the Buddhist Institution in Myanmar? What does the Buddhist Institution in Thailand think and why are they not more vocal? Why do most Rohingya want to reach Thailand? What effect is the up-and-coming election in Myanmar having on the movement of the Rohingya? Why has there been an increase in violence against the Rohingya? What is the role of Buddhist Nationalism? Why is there not a larger Islamic voice on the issue? Especially from Malaysia and Indonesia and Islamic organisations there? Why is the U.S attempting to take a lead on the issue and is it just rhetoric? Why does the U.S rely on Thai government officials for information? Why is there a lack of Islamic solidarity towards the Rohingya? Is the Thai government reluctant to get involved and be critical of Myanmar due to its own human rights issues? 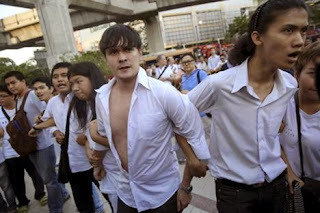 Is the U.S reluctant to help due the current political ‘crisis’ in Thailand? There is an election coming up in Myanmar and nationalist groups are spreading rumours throughout the country about the Rohingya. How can this be counterbalanced and why are the likes of Aung San Suu Kyi voiceless on the issue? There is a lot of talk about a ‘Regional Solution’ however no mention or discussion of the word ‘Genocide’, why? 'Becoming', the newly created English magazine from the Centre for ASEAN Studies at Chiang Mai University. It was edited by myself and contains contributions from leading scholars and students from throughout ASEAN. Articles include significant issues that are affecting ASEAN, book reviews, political discussions, and development project assessments. Numerous governments sent in their military with aid supplies. Nepal, Completely Confusing - Inefficient Government, Efficient Civil Society. 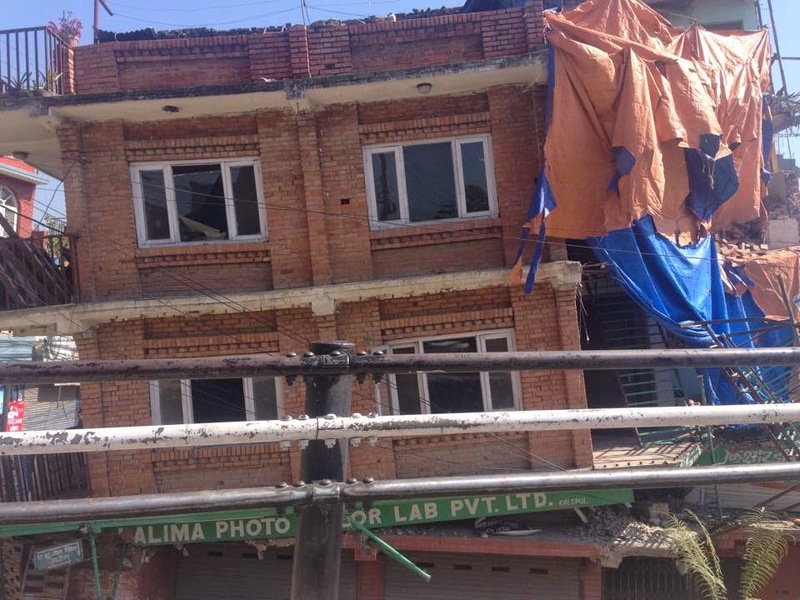 Chaos is endemic in Nepal, both before and after the recent disaster. Although the earthquake caused wide spread physical and physiological chaos throughout the country, chaos has its roots in both the inefficiency of the government and narcism that's endemic throughout the bureaucracy. I and many others have so many questions for why certain things occurred in the aftermath of the earthquake. One of those pressing questions is; Why are/were people stranded in Nepal? Governments such as Australia and Canada constantly stated they had citizens stranded in Kathmandu. Six days after the earthquake the Australian government and other foreign governments sent in military aircraft to ‘rescue’ stranded Australians. Such governments constantly stated that they had citizens who were ‘stranded in Kathmandu’. However, why? Why were they stranded? 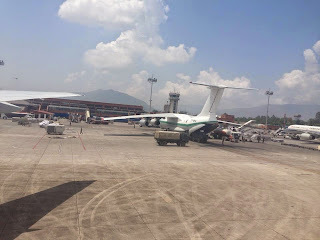 Commercial flights were readily available, the airport was open, flight prices were inexpensive for those who wanted to leave Kathmandu. 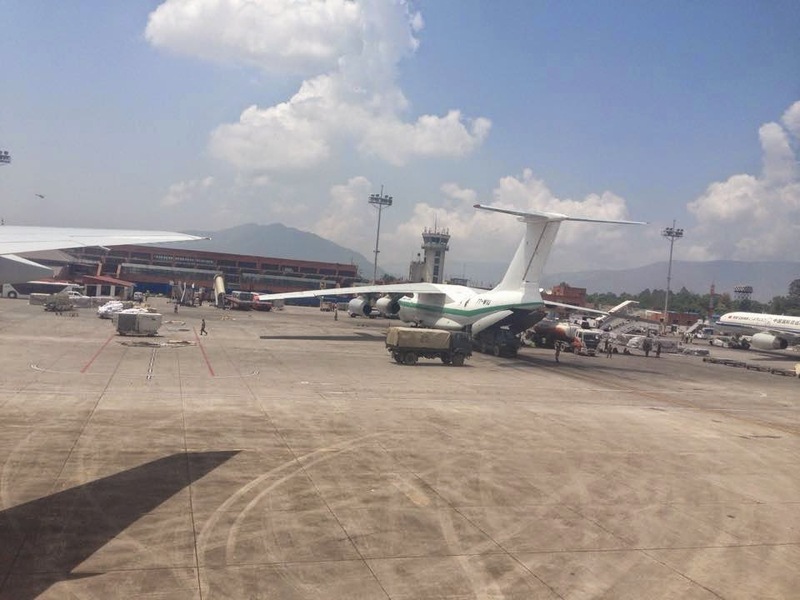 5 days after the quake a friend of mine purchased a one way ticket from Kathmandu to Bangkok for $190USD. Another friend of mine purchased a ticket to Kuala Lumpur for $290 USD. At the same time the Australian government was ‘evacuating people’. Why did they need ‘evacuation’?. Yes, there were problems in Kathmandu however by no means was it devastated or dangerous. People could have booked their own flights and left the city. Is this a case of countries using disaster to strengthen their own political positions in their own countries? Back to the issue of government - Hotel staff, taxi drivers, waiters, and individuals on the street all constantly reiterated how unprepared, corrupt and inefficient that Nepalese government was, both pre and post earthquake. They say it with a sense of sadness, the feeling of having been let down and cheated. They speak in a manner that demonstrates the almost ‘non-existent’ nature of the Nepalese government, or that the government they do have is nothing more than a corrupt guardianship or body. The Nepalese take pride in their country’s natural and historical beauty and traditions and monuments, however, there is a shared ‘embarrassment’ of their government. Last weeks earthquake has reiterated and demonstrated how inefficient and out of touch the Nepalese government is. There was absolutely no preparation or contingency planned for the inevitable earthquake, and Nepal’s already decrepit infrastructure has made recovery near impossible. 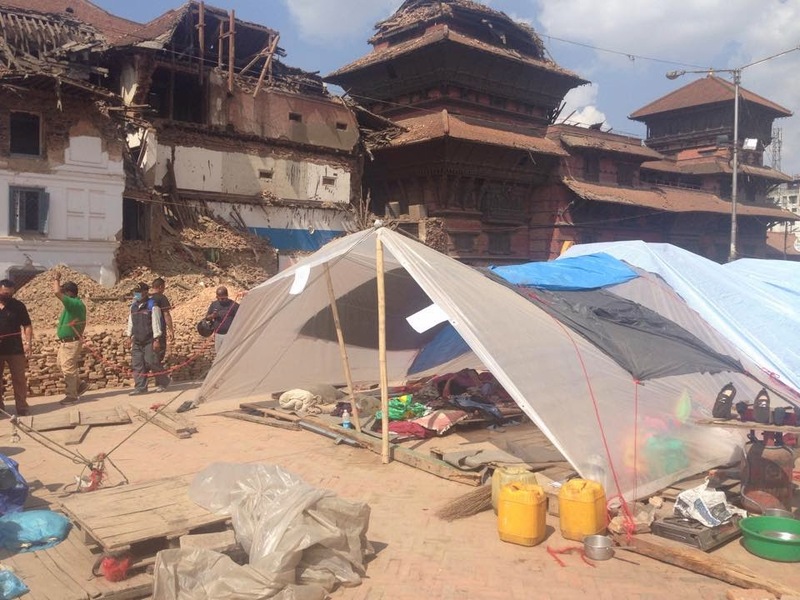 Last week government ministers had a televised meeting where they sat around a boardroom table at the Hyatt Hotel in Kathmandu smiling and talking rather causally about how they can respond to the disaster. It looked staged and completely out of touch with reality. The Nepalese government is also getting nervous. 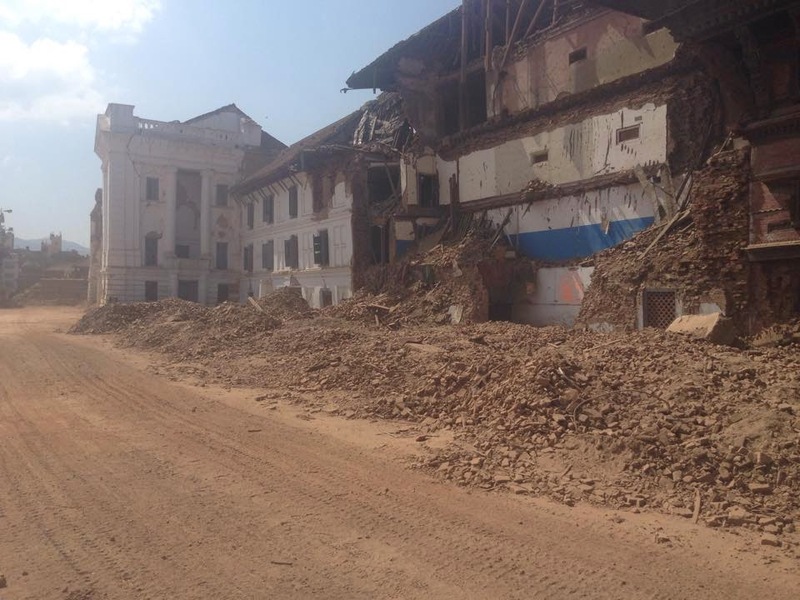 It is obvious it is their desire to intentionally or unintentionally make ‘corruption’ part of the disaster, however with so many foreigners on the ground and with the Nepalese civil society strengthened due to the devastating earthquake, this is complicated and unchartered territory for the Nepalese government. In a similar way the Malaysian Government was embarrassed by their haphazard approach to the missing Malaysian airliner, the Nepalese government has been thrown into the spotlight, with accountability in question. Three weeks ago the Nepalese cabinet announced all foreign search-and-rescue teams must leave the country seven days after their arrival, thus international teams were forced to leave. This was incredibly problematic and concerning as there was still a large search and rescue need in remote villages, and the Nepalese authorities were not equipped to handle the devastation responsibly. A local contact I have in Kathmandu told me this will result in 1000’s of bodies not being recovered and potentially individuals not being rescued. There is a complete lack of understanding by international governments and organisations in how self-serving, illegitimate and corrupt the Nepalese government and bureaucracy is. 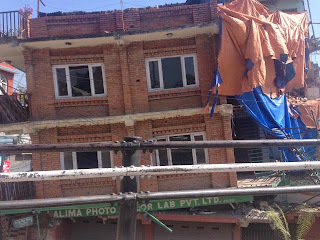 The ADB, AIIB, departments within the UN, and numerous foreign governments, including Australia, UK, U.S, Germany, Thailand, Singapore, and France, are all donating directly or indirectly to the ‘Prime Ministers Earthquake Relief Fund’, set up by the Nepalese government. Everyone that has any understanding of the Nepalese government continually tell me that the Nepalese people will not see one cent of this money, and it will primarily go to officials or those connected to officials in someway. This is going to make the rebuilding of Nepal incredibly slow and problematic, with endemic poverty growing in strength. The level of faith the Nepalese have in their government is significantly concerning. A close friend of mine and a local tour operator explained to me that most Nepalese would rather not go to hospital than go to a government run hospital. Another lady I met who works in a respected profession stated that there is no point sending children to school if they are going to go to government schools. Both points clearly demonstrate the complete lack of respect, faith and confidence in anything related to government. It is also important to single out the Nepalese people from that of the Nepalese government. Too many media reports have been painting a very incorrect picture of Nepal, as they criticise the whole country or they lump every Nepalese into the same category. This is not the case, again, with the vast majority of Nepalese highly critical of their ‘so-called’ government. The service the Nepalese civil society has provide its fellow citizens deserves much praise. And, they too are incredibly critical of Government relief efforts. Youth lead organisations, local clubs, university groups and youth associations have attracted tens of thousands of individuals who are desperate to assist with the relief process. From what I witnessed and heard, these civil society groups and organisations are well organised, strategic, increasingly well-equipped, and passionate. The majority of the time they deliberately bypass government agencies and institutions and have much more efficient results. They have elaborate plans, maps and reasonably good organisation to organisation communication platforms. In what takes government 2-3 days to plan, takes youth lead organisations a few hours to plan and undertake. I have worked within civil society in numerous Asian countries and I have never seen such passion, team-work and efficiency. The earthquake has drawn light on the disastrous government, yet highlighted the importance and strength of civil society and youth lead organisations. There is no doubt, the Nepalese absolutely love their country, a country of beautiful people and outstanding nature. In continuation of a previous post, titled ‘Geopolitics and the Nepal Earthquake’, as argued, geopolitics in the region is significantly changing. The last few days have seen numerous campaigns criticising the Indian media and government in how they are reporting the earthquake and the deliverance of their aid supplies. This criticism is widespread on the streets of Kathmandu and people who would have normally been fond of India have now utter disrespect and disgust in their southern neighbour. 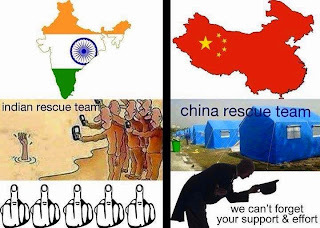 Numerous individuals have told me that China provides aid and humanitarian assistance in an effective and coordinated way, helping the people of Nepal, whilst India helps Nepal only for India’s benefit and for its government to become more popular at home. In fact, it would be no exaggeration to state India is no longer welcome in Nepal at a general population level. It is obvious that China is more effective and controlled in its response. Indian troops seem chaotic and confused, Chinese troops seem mission focused and well coordinated. This is something India is going to have to rethink in how it responds to future disasters throughout the region. By acting in such a manner India is giving China the upper-hand in gaining significant support in Nepal and throughout the region. As previous stated, this will have vast consequences for the region as Nepal turns to China for aid and assistance. Trust for China within Nepal is rapidly increasing. This will now give China another border with India, something India has feared for a long time. It is also going to make it significantly harder for Nepal's large Tibetan population. Below is a meme that is being posted around Facebook and stuck on walls around Kathmandu.